Presented at the Third Annual Conference on Astronomical Data Analysis Software and Systems (ADASS 93) in Victoria, British Columbia October 1993.
in Astronomical Data Analysis Software and Systems III, A.S.P. Conference Series, Vol. 61, 1994, Dennis R. Crabtree, R.J. Hanisch, and Jeannette Barnes, eds., p. 191. The information contained in the two CDROMs of the Hubble Space Telescope Guide Star Catalog has been condensed into a series of all-sky maps. The magnitudes of Guide Stars of the northern and southern hemispheres, which were taken on different types of plates have been calibrated to produce a statistically accurate V-filter flux map of the Milky Way galaxy. Individual object fluxes cannot be calibrated accurately, but by using a large number (16,000 for the first pass, 180,000 for the second) of sources near the equator which were measured on both Palomar and SERC plates, an average calibration can be fit. An intermediate step in the calibration produced a catalog of 180,524 objects in the GSC for which measurements at two colors exist. A catalog binning program, SKYPIC, developed from SKYMAP was used to produce two-dimensional FITS images from the Guide Star Catalog. Maps of source density, as well as flux maps of sources flagged as non-stellar, show excesses at the edges of plates. The Hubble Space Telescope Guide Star Catalog (described by Lasker, et al. 1990, Sturch, et al. 1990, and Jenkner, et al. 1990, and Space Telescope Science Institute 1992) is a valuable resource for astronomers. In addition to helping to point the Hubble Space Telescope, it can be used to aid earth-based observations. A program, SKYMAP, has been developed to search the catalog and make finder charts for astronomical observation (Mink, 1992). Software was also developed to create images from flux points for the Spacelab 2 Infrared Telescope (Kent, et al. 1992). It was a logical step to combine these programs and make all-sky flux images of the Guide Star Catalog. The resulting SKYPIC program adds the improved map projection and catalog access features of SKYMAP to the flux-binning capabilities of the Spacelab 2 IRT software to produce flux images from any point source catalog. To make an image from a typical star catalog, the first step is to turn the magnitudes in the catalog into energy flux, which is proportional to 10 to the -2.5V power. For the Guide Star Catalog, the "V" magnitude from the Northern Hemisphere Quick V Palomar plates was use as the standard, and a scale factor was chosen such that the smallest non-zero bin value was one. Each sky position was then projected into an image array. 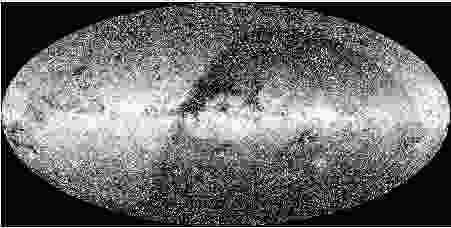 For all-sky maps, the Aitoff projection was used, using the same algorithm algorithm as the IRAS All-Sky survey plates (IRAS Explanatory Supplement 1988). For the first pass, a 30-arcminute pixel size was used, giving an image with 720 pixels in longitude and 360 pixels in latitude. Positions and magnitudes for selected sources were read from the Guide Star Catalog CDROMs. For objects with multiple entries, error-weighted mean positions and magnitudes were used. 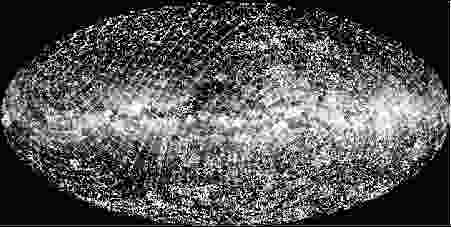 The image levels are scaled so that the faintest star gives one count. For the first attempt, all magnitudes were assumed to be at the same bandpass. Figure 1 shows the result, scaled using SAOIMAGE's histogram method to bring out low flux levels without diminishing bright pixels. The brightness demarcation at the equator shows that magnitudes from the SERC-J plates in the Southern Hemisphere do not mean the same thing as those on the PAL-V Northern Hemisphere plates. There are 180,524 Guide Star sources which appear on both SERC-J and PAL-V. Since an image of the whole sky is being created, only statistical colors matter, not colors of individual sources. A second-order polynomial, chosen to speed the millions of evalutations needed, was fit to the plate magnitudes of the two-color sources as shown in Figure 2. An upper magnitude limit of Mag(PAL) + Mag(SERC) less than 29.5 was chosen to keep magnitude limit difference between the two plate types from biasing the fit. To eliminate misidentifications, sources whose positions differed by more than one arcsecond were also ignored. The fit was used to convert SERC-J magnitudes to PAL-V magnitudes. Figure 3 shows the calibrated image with 15-arcminute bins bringing out more structural detail. Note that there is some faint structure following plate edges. This excess flux may be due to unidentified duplication of sources due to errors in astrometry near plate edges. Figure 4 shows only sources flagged as non-stellar in the Guide Star Catalog. The structure is more pronounced, indicating that there is more flux from nonstellar sources in plate overlap regions, especially in the northern hemisphere (on the upper left). Fuzzy images at plate edges may cause an excess number of nonstellar sources. There may be multiple entries for the same sources due to bad plate solutions near the edges of Schmidt plates. "Guide Star Catalog Version 1.1", 1992, CD-ROM, Baltimore: Space Telescope Science Institute. "IRAS Explanatory Supplement", 1988, eds. G. Neugebauer, H. Habing, P. Clegg, and T. Chester. Washington, D.C.: Government Printing Office. Jenkner, H., Lasker, B., Sturch, C., McLean, B., Shara, M., and Russell, J. 1990, Astronomical Journal 99, 2081. Kent, S.M., Mink, D., Fazio, G., Koch, D., Melnick, G., Tardiff, A., Maxson, C. Astrophysical Journal Supplement 78, 403. Lasker, b., Sturch, C., McLean, b., Russell, J., Jenkner, H., and Shara, M. 1990, Astronomical Journal, 99, 2019. Mink, D.J. 1993, in Astronomical Data Analysis Software and Systems II, ASP Conf. Ser., Vol. 52, eds. R.J. Hanisch, J.V. Brissenden, and J. Barnes, 499. Russell, J., Lasker, B., McLean, B., Sturch, C., and Jenkner, H. 1990, Astronomical Journal, 99, 2059.